Laptops can really crank out the heat, which can be bad for both the computer and the computer user’s lap. If you don’t want to feel like you have a fiery mini-sun in your lap, just follow these easy steps to keep things cool. I packet of sugru, any color. Take 1 packet of sugru and divide it in 4 pieces (2 large and 2 small). 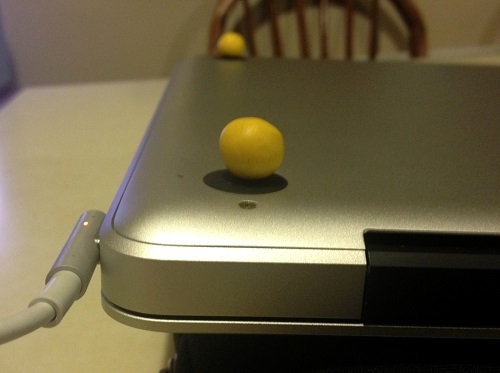 Place the larger pieces over the back feet of your laptop and the small over the front. Dampen the surface of a clean table with a cloth (this stops the sugru sticking to it). 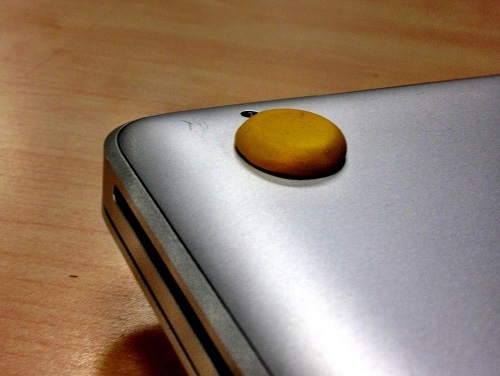 Turn the laptop right way up with the soft sugru legs on the bottom. Gently push on the front corners to make them lower than the back. Lift up, turn over and allow to cure overnight. Presto. Here’s how it works. 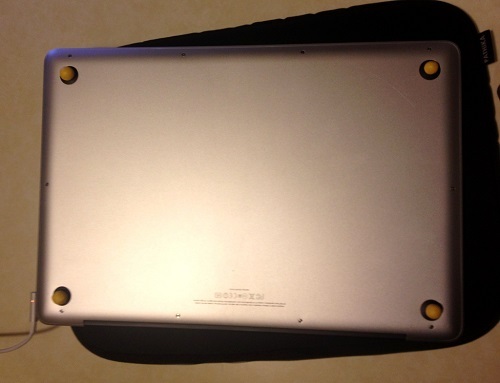 The laptop radiates heat from the bottom of the case. As the base is flat, this heat then becomes trapped as it warms the air beneath the case. This solution creates a slope on the bottom of the case so as the warm air rises, it flows out the back. This, in turn, draws cool air in through the front and the process goes on. Just a few minutes of your time can help your laptop keep its cool, meaning less wear and tear on your laptop’s internal components… and less sweat on your lap.